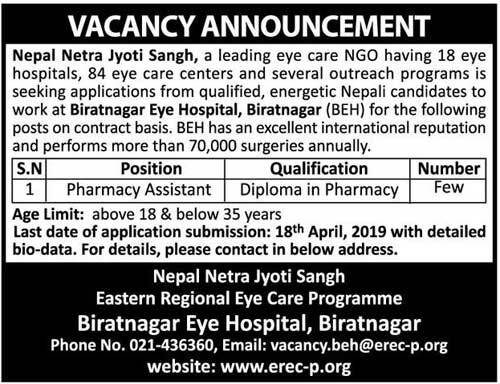 Nepal Netra Jyoti Sangh, a leading eye care NGO having 18 eye hospitals, 84 eye care centers and several outreach programs is seeking applications from qualified, energetic Nepali candidates to work at Biratnagar Eye Hospital, Biratnagar (BEH) for the following posts on contract basis. BEH has an excellent international reputation and performs more than 70,000 surgeries annually. Last date of application submission: 18th April 2019 with detailed bio-data. For details, please contact in below address.